I was thrilled to watch the episode and then be able to pose questions to the two people featured. Hosted by celebrity animal lover Kristen Bell, the hour-long episode is broken into two parts, and here’s what you need to know about the 6th episode in the “Shelter Me” series. UPDATE: Episode 6 is now available to stream online at shelterme.tv. The first half of the episode focuses on Cat Town Café in Oakland, the first-ever cat café in the United States and currently the only non-profit cat café in the country. 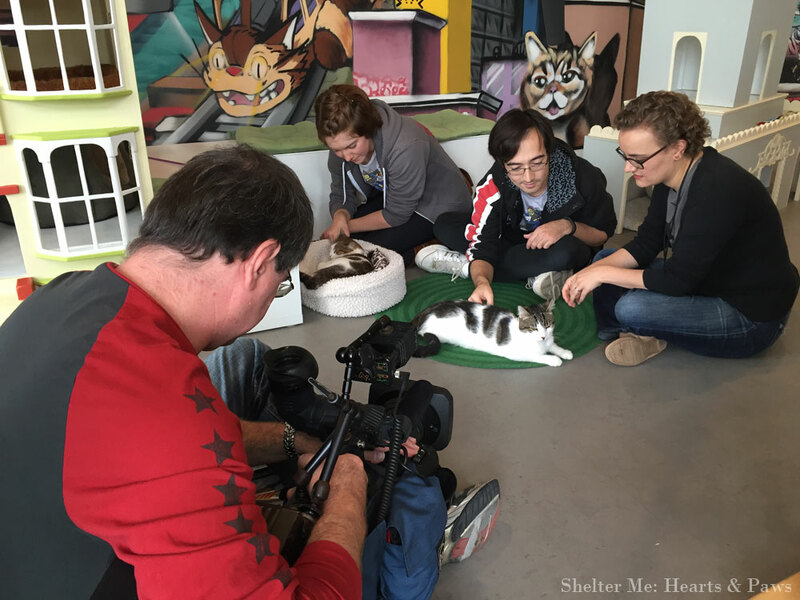 Cat Town Café partners with its local shelter to provide an innovative way to showcase cats and boost adoptions. Potential adopters with a volunteer visiting with the cats. Viewers not only get to see the adorable cats available for adoption at the café, but we also get to follow along and see how the cats are selected from the shelter to be placed at the café. Ann Dunn, founder of the Cat Town rescue group, is quick to point out that they are not rescuing from the shelter, but rather they partner with the shelter. We follow the journey of a few cats selected and also learn about what goes into making Cat Town Café successful. 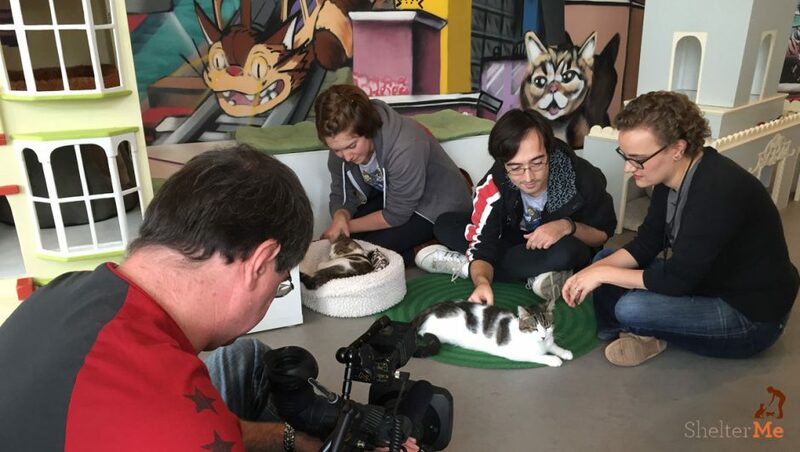 After watching the episode, I asked Ann about the general direction of cat adoptions in the U.S. and how a space like a cat café is beneficial during the adoption process. Ann Dunn, founder of Cat Town Café, being interviewed during filming. The second half of the “Shelter Me: Hearts & Paws” episode features award-winning artist and “Mutts” comic strip creator Patrick McDonnell and the inspiration behind his “Shelter Stories” series. Viewers get to see a behind-the-scenes look at a shelter, as we follow Patrick along as he spends several days at a shelter, meeting volunteers and staff, adopters, and surrendered animals as well as owners being reunited with lost pets. It is fascinating to watch Patrick meet an animal or adopter, get his inspiration and then immediately start sketching. At one point in the episode Patrick points out that a misconception about shelters is that there is a lot of sadness – but he also sees a lot of joy, and that is apparent in his strip. Patrick mentions that he always knew he wanted to be a cartoonist and loved Peanuts and Krazy Kat – two strips where he saw spirituality and kindness. I mentioned to Patrick about his being inspired by Peanuts and Krazy Kat – and now using his talent for good with the “Shelter Stories” series, what does he hope to inspire in other cartoonists with this series? In both segments of the “Shelter Me: Hearts & Paws” episode, there are tear-inducing moments, both from happiness and sadness. I said “awww” out loud more times than I can count – and there were a couple of “oh my goodness” moments for me as well. It is wonderful to know there are people out there who dedicate their lives to helping animals, like Ann Dunn, and people who use their celebrity and influence to bring attention to shelter animals, like Patrick McDonnell. This episode, and the series in general, sheds light on these individuals and reminds viewers about the importance of adopting or simply supporting shelters in your area. And what better way to be reminded of this than by watching these positive and uplifting stories. While I was permitted advanced viewing of this episode, I can tell you that this is something I would have watched regardless. It is quite inspiring as well as educational. It’s a must-see for any animal lover. “Shelter Me: Hearts & Paws” premieres on May 22nd on PBS, and you can check your local listing to see when it will air in your area. Also, the first five episodes of the “Shelter Me” series will begin streaming online for free at ShelterMe.tv on May 24th. Celebrity hosts include Jon Hamm, Jane Lynch, Allison Janney, Katherine Heigl and Edie Falco. Here is the promo piece for episode six. It starts about 30 seconds in, after the Petco Foundation promo. I hope you tune in on May 22nd and enjoy “Shelter Me: Hearts & Paws” as much as I did! “Shelter Me: Hearts & Paws” – Episode 6 Trailer from Steven Latham on Vimeo. What do you think? Is this something you would watch? Ow. Love this! Thank you for sharing! For one thing we have ALWAYS thought that this is the way to thoroughly enjoy the adoption process – meeting the cats when they’re relaxed and not pinned up in a cage all stressed out. True personalities shine through – it’s the RIGHT way for this “meeting” to take place. Cat cafes are a wonderful idea in this regard. This series sounds wonderful – there will be sad and happy moments of course because we all care so much for animals and it’s an up and down experience no matter HOW you look at it. Still, the UPS are so wonderful and each time an animals I adopted, it’s a BIG UP. Thanks for sharing all of this with us – no doubt it will be a popular series. I completely agree! The UPS make it all worth it! Oh darn! It looks like the PBS station we get here isn’t carrying it. :-( And more often than not, cross-border online streaming doesn’t work. But I’ll try. It’s so true; shelter stress is literally a killer. That’s how our partnership with the city’s shelter works. We (the rescue) pull the most at-risk (physically/socially/behaviorally) cases out of the shelter and put them in foster care. The transformation from scared-practically-feral to purring lap cat is *constantly* amazing. Then adoptions often happen from the foster’s home where potential adopters can see the cats in a more comfortable environment. That is so wonderful that you get to witness this transformation first hand! I look forward to seeing this! I know I’ll probably need tissues near by. Don’t worry – it’s definitely not overly sad or anything. But those cats and dogs – they get me every time! I haven’t been to a cat cafe, but I love that it is helping more kitties get adopted. And have more space and attention being out of a cage. Looks like a great comic, too! I’ve never been to a cat café either. I can’t wait to go to one! Perhaps I should road trip up to Oakland just to visit this one! Oohhh… That sounds like a wonderful show! Will have to book the chesterfield in front of the TV, this Sunday, for sure. Purrs, Seville. Hope you enjoy it! I’m sure you will. Love this! I will definitely be checking out an episode very soon! Yay! They really are uplifting stories! This sounds really great. We sure hope it helps get lots of kittys adopted. This show sounds great! I would watch it for sure. With as much as animal rescue is growing in the US, I can see this being a hit. It is also a good way to spread awareness of pet overpopulation and the issues that have come with it. I was going to ask if these shows are available for streaming anywhere and you answered my question! I don’t remember seeing these listed in my area at all so I’ll definitely be checking it out, especially this one! This sounds like a really good show…the mom will be watching! We don’t have cable or anything, so hopefully they will have recordings of the show online. We would love to watch it! It sounds like a really neat series. We are getting a cat cafe in Atlanta, which is just a couple hours away from us. We’ll be visiting for sure! OMC! You met the Mutts’ cartoonist! We love him and were just looking to buy those Little Pink Socks! He’s where I got the shousies word from! Gotta mark this on the calender. I’m looking forward to watching this series. We have not heard of this show – we will most definitely check it out, thanks for sharing this! We’ll help spread the word – oh and we just LOVE Mutts!! Chicago is getting a cat cafe. I’m hoping to visit it! I hope they put the episodes online at some point to watch. I love that comic strip. That’s why I teach high five too! I love this and would definitely watch! This is such an interesting show! Can’t wait to watch it! I loved the Cat Cafe idea. I’ll definitely check it out when in Oakland. I definitely want to watch this and am so happy to see shows like this on TV. Awareness is so important! Can’t wait to see this!!!! So glad I saw this before the premiere of “Shelter Me: Hearts & Paws”! Thanks for sharing! Sounds like a wonderful series. Nice all the celebrities are doing their bit to educate and build awareness. Oh I wasn’t aware of Shelter Me — and I love Patrick’s comics and have a few of his books. Of course I’m going to watch this series! Yes – I would love to watch this series! I will check that out. Sounds amazing. Such an amazing opportunity! I’m so excited that you were able to be a part of this! Great post and thanks for helping to spread the word about helping animals in need! This looks like a really great series! I’ve saved the site to my bookmarks so I can start watching when then begin streaming. :) Thanks for letting us know about it! We watched this screener, too, and thought it was amazing! I look forward to going back and watching previous episodes. We will most DEFINITELY watch this. It looks amazing! Thanks for letting us know about it. I can’t wait to see the show! I’ve loved the idea of the cat cafe since I first read about it! I’m sure there are many “awww” moments in this show. I will have tissues at the ready! How wonderful you were able to be part of it! We don’t get that channel either but enjoyed reading all about this place. What a wonderful idea to have a place like that to help find animals homes. I will absolutely watch this! I love any program that supports and encourages adoption and helping homeless pets. I love this! Having worked in an animal shelter, I have a special place in my heart for the work that goes on behind the scenes and how extraordinarily special the pets adopted from shelters are. I truly believe shelter pets KNOW you’re rescuing them and the bond is a thousand-fold closer. Fantastic post here and I love your site!